Toronto limousines have always been associated with luxury – especially when it comes to events like weddings. Not only are they sleek and comfortable, they come with world-class amenities that really make a bride and groom feel like royalty. Wedding limousine amenities range from fine wine to neon lights. Even the most basic of limos come with a decent amount of amenities and services. Whether you just need a ride from your hotel or house to the church, or you want to take your entire entourage around Toronto on your big day, you can find a wedding package that suits your needs. You will be able to select the music ahead of time if you have your own playlist in mind. Just ask the company you choose about their music policies. As long as you book your transportation with an ideal company, such as Majestic Limo Services, you can expect royal treatment with your package: red carpet reception, the Just Married Sign, uniformed chauffer, icy cold drinks, and more. Some packages also include wedding decorations. On your way to the church and/or reception, you can be surrounded by all the romantic décor you need, including balloons, confetti, party hats, and more. For longer rides, you can expect the bar to be fully stocked. 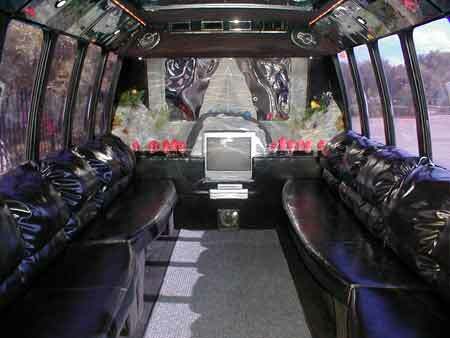 Party limo buses usually come fully stocked with a variety of drinks, ranging from water to alcohol. Complimentary snacks may be available as well. Larger vehicles also come with dance floors if you want to go ahead and have your party in a luxurious party bus! Some party buses also come with a bathroom – which is a must if you’re planning a large trip around the city. Most limousines, from small vintage cars to Hummers and party buses, are clad in premium leather. Some custom built models may even have fur or suede linings. Whatever your limo seats are made of, you can count on them being extremely comfortable and luxurious. The seats tend to be wrap-around – even in the buses. Entertainment may or may not be a priority, depending on the length of your ride and whether or not you simply want to lie back and relax. If you do want to enjoy some entertainment, you can request amenities such as a television, DVD player, stereo, etc. Simply request the movies you want to watch when booking your ride. A lot of limos in this day and age come with Wi-Fi internet access and other communication services, such as a fax line and mobile telephone. If you will need features such as these, ask if they are available with wedding packages when requesting a quote. When planning your wedding in Toronto, ask a company such as Majestic Limo Services about their wedding limousine amenities and packages. Let them know if you have any specific requests.